The Evolution of the Philadelphia Terminal When William H. Rau was commissioned by the Pennsylvania Railroad he found himself illustrating a company on the verge of unprecedented growth and change. Through the rest of the 1890s and well into the 20th Century the Pennsylvania Railroad would embark on some of its most ambitious system improvements to expand main line and terminal capacities. Philadelphia, the corporate headquarters of the Pennsylvania Railroad was a focal point for many of these improvements, including new yards, stations, grade separations and electrification projects. 1891 photograph of the original Broad Street Station reveals a terminal that is less than one year from undergoing "modernization" by noted architect Frank Furness. During that project the station would see the elimination of the multiple train sheds in favor of a single glass and iron shelter covering 16 tracks that measured roughly 600’ long, 300 wide and 100 feet above the tracks. Note the ongoing construction of Philadelphia City Hall, including the pedestal that the iconic William Penn statue will stand on. William H. Rau photograph, Collection of American Premier Underwriters, Inc.
During this evolution the railroad commissioned photographers like Rau and William N. Jennings to meticulously catalogue the progress of various projects. This effort by the railroad connects to an important part of the Main Line Project, the use of historical imagery to inform viewers (and photographer) of the past significance of a given subject or place. This imagery allows us to visualize the continual change of the Philadelphia Terminal from the original Broad Street Station to construction of the north-south gateway we know today as 30th Street Station. By examining the images we gain a perspective of the complex changes during the Philadelphia improvements, a subject which will warrant further in depth discussion at another time. This image illustrates the changes to Broad Street Station during the 1892 modernization. Note that the railroad left the original canopies in place where possible to protect passengers until the new shed was complete. Despite the heavy construction the railroad would not allow the project to interrupt passenger service. This was typical practice on the Pennsylvania Railroad. William N. Jennings photograph, Collection of Library Company of Philadelphia. Beginning in the mid 1920's the Pennsylvnia Railroad sought to eliminate Broad Street Station, replacing it with two new stations and modifying another existing station to provide three primary facilities serving commuter, east-west and north- south passenger service. 30th Street Station would be built on the west bank of the Schuylkill River, necessitating extensive changes to the rail yards pictured here, including the elimination of the railroad shops and West Philadelphia Station in the bottom right corner. This image is looking east from the office tower built by the PRR on 32nd Street, known today as the University Crossings Apartment Complex. Photograph by William N. Jennings, courtesy of the Charlie Horan Collection. This view reveals a perspective of the finished Philadelphia Improvements showing how the Pennsylvania Railroad's efforts continue to serve the traveling public today. Seventy six years after the 30th Street Station complex opened, the matching steam plant and neighboring Pullman commissary would be demolished to make way for a parking lot and maintenance facility for Amtrak. 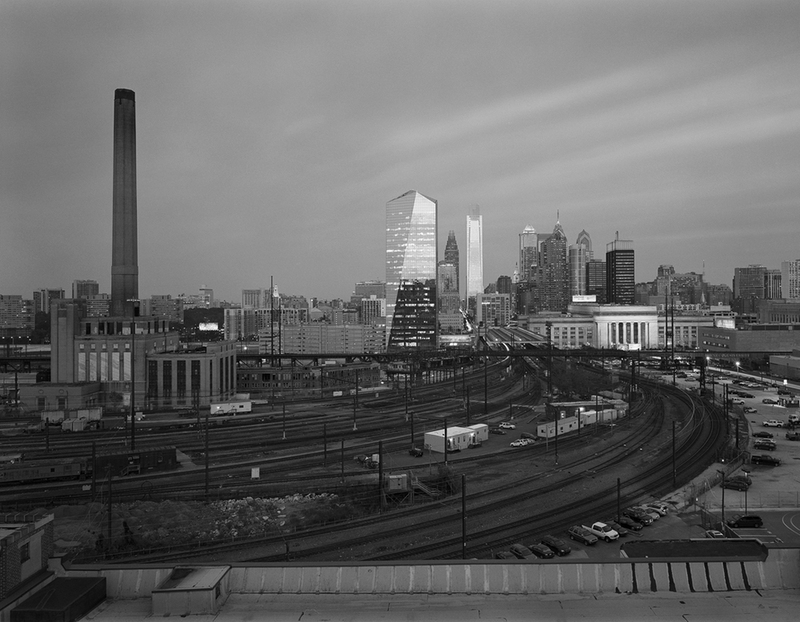 Just two weeks after this photo the landscape would change yet again with the removal of the iconic steam plant, known affectionately to Drexel University students as the Drexel Shaft. This post is part of a lecture I will present this Thursday, March 7th from 6-7 PM at the Library Company of Philadelphia, who has on deposit over 450 original Rau images from the Pennsylvania Railroad Commission, as well as an extensive collection of William Jennings photographs. If you are in the Philadelphia area I encourage you to RSVP for the lecture at the Library Company of Philadelphia. The presentation will discuss how the dialogue between a historic and contemporary photo project evolves and will include a few original prints from Rau and myself in addition to the excellent exhibition, Frank Furness: Working on the Railroads. The Furness installation includes an amazing collection of artifacts, photographs and architectural drawings of architectural commissions for the Reading, Pennsylvania and Baltimore & Ohio Railroads.